Yesterday, was the eighth anniversary of my 39th birthday. I took the day off from work, as usual, to officially mourn the loss of my youth. 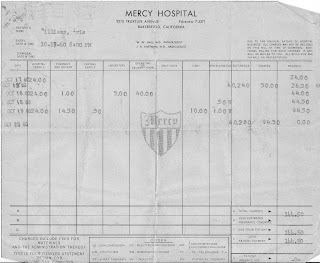 This is a scan of the hospital bill from my birth. At work on Tuesday, Fred brought a banana cake and we had that after playing a couple of hands of cards at lunch. A few hours later, the nurses brought out a cake to celebrate mine and Jen's birthday. Both cakes were great! 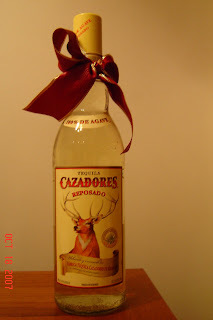 After sleeping in most of the day Wednesday, I went over to hospital to pick up this gift of my favorite tequila from my friend, Flora. Thanks Flo! I then headed over to Ryan and Briana's for a special breakfast for dinner birthday meal. We had scrambled eggs with turkish sausage. And, if that wasn't enough, we had pancakes with a wonderful maple syrup from New Hampshire that Briana got for me. She was also very sweet (i.e. 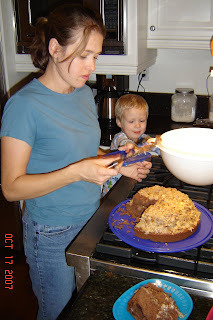 I twisted her arm) and made me a german chocolate cake. I just wanted to thank you for a wonderful birthday evening. 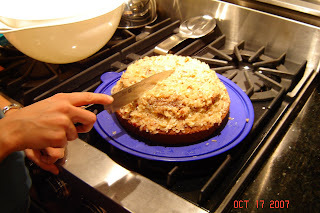 Thanks to Eva, who sent me her recipe for the cake frosting. Briana did you proud. The day was made even more special with a rendition of Happy Birthday from my favorite toddler.